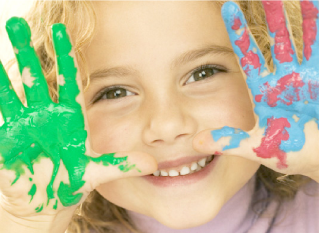 Finger paints are a fun and inexpensive activity for kids, preschoolers and toddlers. These are the best finger paint recipes and are all easy to make and great for art parties, play dates and anytime your child wants to have fun! These are our favorite homemade recipes that are safe and non toxic. Included are variations that are no cook, non staining and edible. How Long Does Homemade Fingerpaint Last? If kept in an air tight container homemade fingerpaint will last up to 1 month. Adding a few drops of liquid dishwashing detergent to the finger paint will give it a smoother consistency and will give paintings a shine when dry. In large bowl mix cornstarch and 1 Cup of the water. Then stir in remaining water. Microwave mixture on high for 8 minutes until it is thick. Stir every 2 minutes. Divide mixture into 5 or 6 bowls and add food coloring. Cool completely before using this easy fingerpaint recipe. Stir together 4 TBLS sugar with 1/2 Cup of cornstarch. Add in two Cups cold water. Place on medium heat and stir until thickened. Don't overcook - it will thicken more as it cools down. Separate the finger paint mixture into 4 containers. Mix in food coloring to desired color. Stir water and flour together over medium heat. Heat and stir until mixture is a thick smooth paste. You'll know it's ready when the edges start to pull away from the sides of the pot. To reach the consistency that is right for you slowly add cold water to the pot and mix. Divide mixture into containers and add food coloring. This easy finger paint recipe uses flour and water in 1:2 scale (1 Cup Flour to 2 Cups Flour) so you can make more or less depending on how many children you are making it for and how many colors you would like to create. Mix water and flour together. Separate into containers. Color each container with a different color of food coloring. Paint! Non toxic and safe no cook recipe. Mix the tempra and starch together in a bowl until well blended. Add water a little at a time if needed. Make up different colors in different bowls as needed. When using these finger paint recipes for birthday parties make up the finger paints before the party. Try to do the fingerpainting near the beginning of the party so that the art work will have a little time to dry before guests have to take their pictures home. To help the drying process have an adult use a blow dryer to help dry them out.